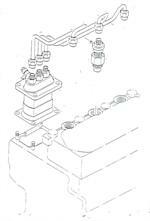 Inline Block Injection Pumps used on many Japanese and some U.S. tractors are rebuilt at our shop. Please do not take apart before shipment we need units to be fully assembled due to settings that we need to check. These Inline Rotary pumps are used on many Japanese and most U.S. Tractors. We rebuild your pump in our shop. Please do not take apart before shipment we need units to be fully assembled due to settings that we need to check.